Report for 2018 reveals significant market growth at LeoVegas Canada, Denmark, Finland and Germany. The past few weeks have seen a number of especially proud moments for the LeoVegas Group. The Swedish brand is coming off the heels of its most challenging year in company history, ending with a record setting December, and in January, the 7th anniversary celebration of LeoVegas Mobile Casinos. On Tuesday, the Stockholm-listed iGaming operator issued a press release disclosing its Q4 and 2018 performance figures. Despite a year of regulatory transmogrification in the UK, LeoVegas not only recovered from a drastically low revenue yield in October, it set all new record highs just two months later. After suffering a remarkably weak October, December’s strong figures delivered a fantastic overall report in Q418. Highlights include a 25% increase in revenue, an EBITDA margin of 9.6%, and 7% organic growth in local currencies (14% excluding UK). LeoVegas CEO Gustaf Hagman called 2018 “an educational year” for the young company. Hagman goes on to praise the group’s perseverance. “We ended the year with all-time high revenues in December, and with record-high customer activity,” he said, eluding to the brand’s significant market growth in four other operating jurisdictions. Customer activity logs were especially impressive in Canada, Denmark and Finland, but none more so than they were in Germany. As usual, Germany was a source of substantial customer growth, representing the largest regional up-tick of more than 200% in Q418. The CEO was especially proud to share new and returning customer activity figures with investors. The number of loyal, returning depositors was up an impressive 46% from 124k to 181k. The total number of all depositing customers was up 29% from 253k to 327k. Do the math, and that’s approximately 146,000 new depositing customers on the quarter. The new year has already started off with a bang in 2019, and shows no signs of slowing down. Already, the company has experienced a 42% rise in its depositing customer base in January. Revenue grew to €28.7 million, up 16% from €24.8m year over year. 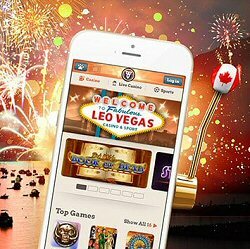 That has a lot to do with LeoVegas being among the first licensees to enter its home market of Sweden on January 1. Revenues weren’t quite as high as the company hopes from new Swedish customers, but Hagman attributes that to a high rate of new players wagering with welcome bonuses. Another growth catalyst for the firm was secured in Q4 when LeoVegas applied for an operational license to participate in Spain’s online gambling market. The company projects a Spanish-facing launch to occur sometime in 2019. With its focus now shifting to technology innovation, the company may be looking at another record year when 2019 comes to a close. If things keep going the way they have been, customer activity is sure to increase further across LeoVegas Canada, Denmark, Finland, Germany, Spain and Sweden, among others.